What is/was Sea and Space? An artwork. A gallery. A place. Sea and Space is a gallery Lara Bank founded in June 2007 that operates as an artwork. Bank considers it a Place Artwork, which she defined as a spatial location to be occupied by the artwork, statements, and thoughts of others. In this case, the others were artists, guest curators, lecturers, and collaborators. Bank's role can be described as Director of the gallery and Context Developer of this artwork. Bank carefully crafted the mission, the format, and the operations from its inception and then refined much of this with the advice from our Board of Directors over time. From 2007 - 2010 this was a solo project with the support of a board of 5, which formed after the first year. Bank chose to operate on an alternate model to a commercial art space. Her goal was to foster, through appreciation and support, artistic practices that are dependent upon alternate means for visibility. She did so with the certainty that without such forms of support, artists who make work that is not marketable due to conceptual, political, formal, or social differences will remain culturally undervalued. Is Sea and Space over? 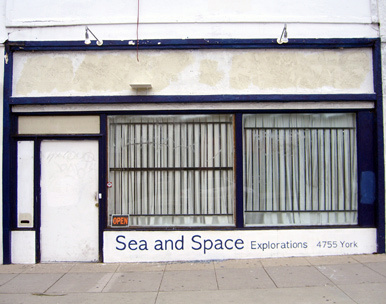 Sea and Space, as an art space, ended due to a lack of resources. Change in the Los Angeles art scene is possible, but costs in terms of time, effort, and money, and in this case developed individually and then work outwards. Two months of operations for the year were funded through fundraisers and individual donations. The rest of the year was paid out of pocket by the founder, which is common for budding non-profits and alternative art projects. None of the artists or performers were paid. All met here equally and put their resources into making this a space where we could do our work. Grants were applied for, but not recieved in time before resources were depleted. So, the space is being rented out, but the concept lives on. We still need more artist defined places in Los Angeles, all uniquely their own, defined by the needs of individuals. Imagine an equal number of situations like this to commercially driven spaces or museums, developed through independent and non-profit funds. If artists are encouraged to put their money and time (no matter the amount) into projects developing opportunities for others and themselves, guided by their ideals, then things could change. The competitiveness that defines the contemporary artists’ profession could decline and opportunities could be mutually developed and exchanged. The quality of work that we see publicly would improve. It is up to you to make and promote an independent system where artists have control over their own work. Do not wait for assistance or change. Artists must define their own value on their terms. It will work. Thank you everyone who was a part of this project! This space was for you!